The Breaded Vegan Shrimp were pretty interesting. I baked them in the oven according to package instructions for about 15 minutes from frozen. Crisped and brown on the outside, firm, chewy, and white (with a novel orange skin!) on the inside. These were more realistic than I thought they would be. Very shrimpy! 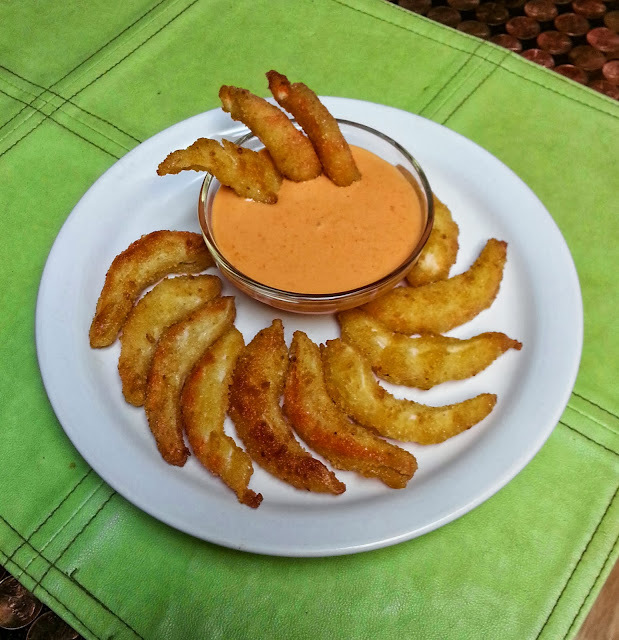 I served these up appetizer style with Spicy Sushi Sauce for dipping. Pretty tasty. They are also soy free, so bonus for those with soy sensitivities. Would I buy them again? Sure! The novelty alone is reason enough to pick these up and bring them to a party or potluck. I used the fish fillets in a sandwich, a cruelty free, healthier version, just ever so sightly reminiscent of one of those at the evil fast food restaurant that employs a freaky clown who lives under some golden arches. 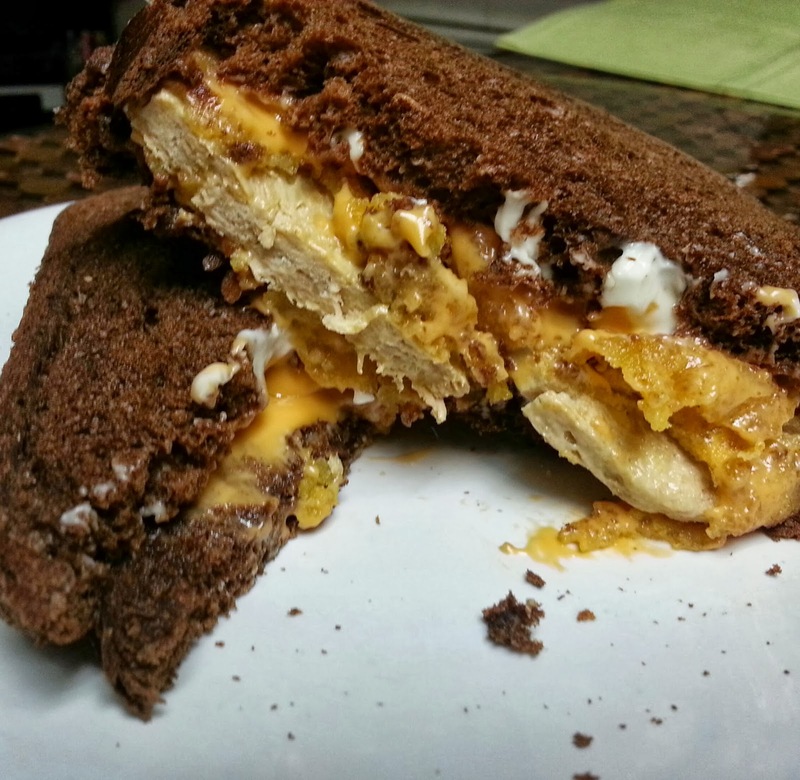 I used 2 slices of pumpernickel bread, a fat schmear of Vegenaise, 2 slices of the new Daiya Cheddar Style Slices and 2 pieces of the Breaded Vegan Fish Fillets. I cooked them in my toaster oven, according to the directions on the box, which was fast and convenient, a no brainer. When I pulled them out, they definitely smelled like what I remember a fishstick to smell like. And the breading was definitely what I remember fishsticks were like. They taste good, I would say a little more like chicken then fish, but they do taste good. The texture is interesting. Not flaky, as I would have expected, but more like a cross between tofu that has been previously frozen (which is a good thing) and seitan. Would I buy them again? Sure! Right off the bat, I will admit that I was the most skeptical about the Breaded Vegan Scallops. Their appearance was more like a short tater tot, than that of a scallop, but of all three, these probably tasted the best! I pan fried these, according to package instructions, straight out of the freezer and served them with linguine alfredo (the sauce was Earth Balance, Garlic, Almond Milk, Daiya Jack Style Wedge, and black pepper.) They were very buttery. The flavor was mild, and they were only lightly breaded (a good thing!) The texture was similar to the shrimp. These are also soy free and gluten free...so bonus for those with sensitivities. Would I buy them again? Sure! Want to try Sophie's for yourself? Follow the prompts in the widget below and I will send you a Sophie's prize pack. Because these are perishable, I can only ship within the Continental United States. I have some of Sophie's prawns in my freezer that I keep meaning to use in some spring/summer rolls. This is motivating to me to try that finally. I'll have to pick up a package of the scallops! I tried the unbreaded shrimp once and thought they were a little odd. I'm still really interested in the breaded stuff though! I've just been hesitant to try it after my first experience. Oh man I just saw these in my local grocery last week, but haven't had the chance to try them yet. I was kind of skeptical too, but the scallops are really enticing. I mean vegan scallops you know? I have had vegan shrimp at vegan Asian restaurants before and it has always been good. I had vegan shrimp scampi once. Right after that, the store quit carrying it. Small redneck towns are not the best source for vegan specialties. I'd love to try more, though! Vegan "seafood" seems pretty odd to me. I have never tried it, because it is pricey. If I win I'll give it a go! Weirdest vegan food I've had is chicken legs by May Wah - like a drumstick but with a wooden stick inside of it. I have some Sofie's crab cakes, what a coincidence, in the freezer that we are going to have tonight. I've never had any of the Sofie products, so now I'm excited to give these a try. I'm going to prepare them according to the package and serve with garlic, sauteed green beans and a tossed sald. Joni, you make everything look mouthwatering good. I've never tried these yet. Thanks for the review. Maybe I just didn't understand how to prepare it, but the most odd vegan substitute I've had is the hamburgers in a can.Unusual flavor and texture. I think canned "meats" are the weirdest ones ever...I saw vegan hotdogs in a can, and it totally grossed me out! ha ha May Wah, a vegetarian chinese wholesale and retail supplier in New York's china town sells a life size frozen mock-lobster that is fully sculpted and colored to look exactly like a lobster! One of these days I *will* try it (gotta get my courage up). The weirdest thing I have ever tried would have to be mock duck at an asian restaurant. The look and texture were oddly realistic, though I have never eaten duck, even when I ate meat. Love it and Sophie's! 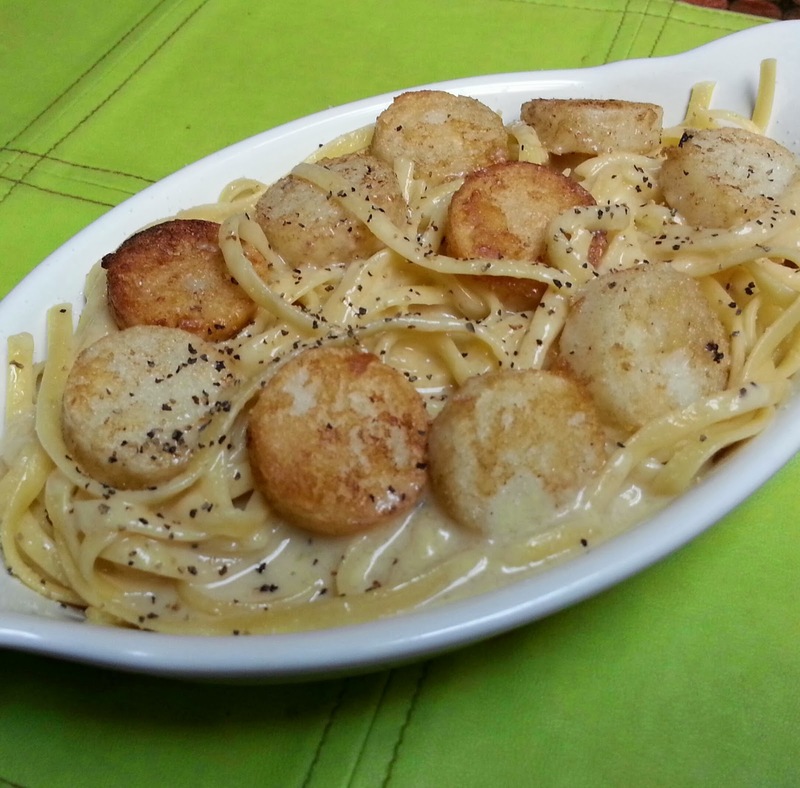 Could you please post the linguine alfredo sauce recipe? That looks so delicious! Id love to find some really good mock seafood. Definitely mock duck from an asian restaurant...too weird for me! I really, really miss (and I know this is gross...) sardines. If someone would make sardines in mustard sauce, I'd definitely give them a try. I have heard of vegan "haggis" but I don't think I would ever try it. wow it looks so delicious! thanks for sharing!